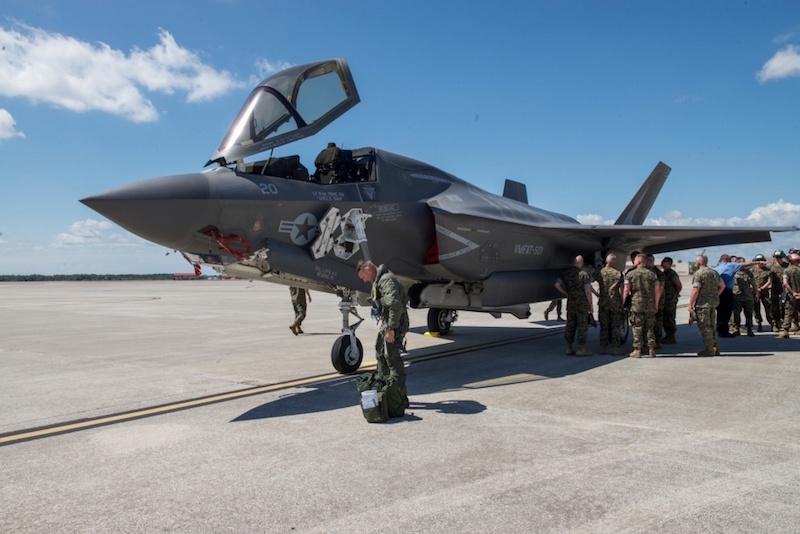 MACDILL AFB --– The F-35B Lightning II aircraft arrived at U.S. Central Command on MacDill Air Force Base, Fla., April 4, 2018. The purpose of the two-day visit was to inform CENTCOM senior leadership on the capabilities and limitations of the F-35B platform before it enters the CENTCOM area of responsibility. The F-35B is fully operational, ready for combat and will make its first combat deployment aboard the amphibious assault ship USS Essex as part of the 13th Marine Expeditionary Unit increasing air dominance capabilities and meeting the demands of the complex CENTCOM environment. The jet can conduct full spectrum combat operations from simple to complex for the Amphibious Readiness Group and the 13th MEU. The F-35B provides strategic attack capabilities that allow it to destroy or neutralize adversary targets that threaten ARG/ MEU Marines, Sailors and other U.S. or coalition assets. “What we want to do is make sure this jet helps out the entire MAGTAF, specific for MAGTAF operations, obviously the Marine rifleman but everybody we’re supporting on the ground,” said Vaughn. Advanced avionics equip the pilot with real-time access to battle-area information with overall coverage. With this technology, commanders in the air, on land or sea are able to receive data collected from the F-35B’s sensors that will empower them with a high-fidelity view of ongoing operations. The F-35B combines next-generation characteristics with radar-evading stealth and advanced logistical support with a wide-range sensor package over any fighter aircraft in history. With the addition of the F-35B, ARG/MEU missions will become more lethal and survivable on land, air, and sea. It increases the efficiency or ARG/MEU through next-generation technology, lethality, and battle-space awareness. The F-35B also provides war-fighting capabilities for the future of CENTCOM, ARG/MEU, and Joint Force. This aircraft brings all of the access and lethal capabilities of a stealth fifth-generation fighter or a modern bomber. It is an all-threat environment air support platform. “What the F-35B gives you is multi–role capabilities, so now you have one aircraft that can do a broad range of capabilities and do it to a level that none of the legacy aircraft have been able to do to this day,” said Macias. The aircraft’s capabilities have been demonstrated during training such as Weapons and Tactics Instructor Course, Exercise Red Flag, Agile Lightning, as well as day-to-day training across the fleet. The Marine Corps has activated four squadrons and has over 35,000 flight hours in the aircraft. “The jet is in the fleet, it’s here it’s now, it’s deploying, it’s deploying with the MEUs,” said Vaughn.